Unsustainable fishing practices drain the oceans of fish and subject vulnerable workers on fishing vessels to severe forms of labor exploitation. As news of horrific abuse on fishing vessels continue to shock the public, the number of initiatives attempting to address human rights abuses in seafood supply chains has proliferated. While some of these initiatives claim to have a worker voice component, the freedom to associate and collectively bargain that underpins respect for human rights is conspicuously absent. ILRF is calling for a new way forward – one in which binding agreements ensure retailers and seafood brands take responsibility for conditions in their supply chains and crew are empowered to secure effective remedy when their rights are violated. This vision is outlined in a blog ILRF released today, which is a preview of a report ILRF will release in one week. Taking Stock: Labor exploitation, illegal fishing and brand responsibility in the seafood industry documents the results of ILRF’s Independent Monitoring at Sea (IM@Sea) project, and lays out a path forward for industry actors and government agencies aiming to fulfill their human rights responsibilities in the seafood sector. 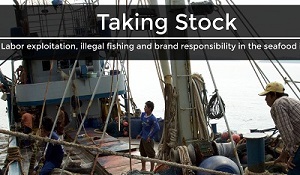 In addition to providing principles and lessons learned, Taking Stock is a call to action for companies all along the seafood supply chain, and governments with oversight responsibility to adopt effective, worker-centered tools and policies to ensure respect for human rights in the global seafood trade. The report launch event will be an opportunity for stakeholders and practitioners from labor, government, industry and civil society to discuss how the principles and proposals detailed in the report might be implemented. We hope it will serve as a platform from which to launch worker-driven solutions for a more just trade in seafood.